Our Premier Garden Shed is designed for exceptional value. 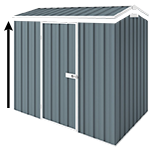 It is a well made Absco Shed on an unbelievable price. This 3m x 2.26m x 2m double door zincalume shed is a versatile shed which can store household goods such as gardening and sporting equipment. This is a great addition to your home.